Oh! The Agony in Beekeeping! http://coloradobeekeepers.org/wp-content/uploads/2017/10/csba-logo-for-footer.png 0 0 Tina Sebestyen http://coloradobeekeepers.org/wp-content/uploads/2017/10/csba-logo-for-footer.png Tina Sebestyen2018-09-17 20:37:372018-10-19 14:27:59Oh! The Agony in Beekeeping! Finding clues in brood frames, hive inspection. 1) Is there a queen, and does the brood look all right? 2) Does the colony have enough food? 3) Does the colony have enough room? The top left photo shows capped brood. Capped brood alone does not tell us that there is a queen present. It tells us that there was a queen present 9 days ago. (brood gets capped 9 days after the egg was laid). 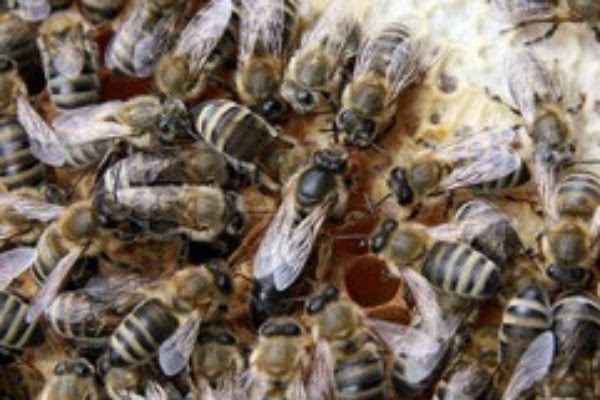 Once there is no capped brood we know that the queen has been missing for 21 days, since that is how long it takes for brood to go from egg to emergence. 1b) Does the brood look all right? The top right photo shows larvae on the left side (those wormy things floating in royal jelly) and eggs on the right side. Eggs that are standing up straight were laid today. Eggs laying half-way over were laid yesterday. Eggs laying on their sides are 3 days old. Seeing eggs in any position is good enough to think that there is a queen present. Just seeing the queen, bottom right photo isn’t really enough for me. I want to know that she is laying, and that the brood is looking good, so I always want to see the eggs, larvae, and capped worker brood. If you see a queen and only capped drone brood, she may be brand new and not laying yet, or she may have run out of sperm, a drone layer. This is a good reason to mark your queen, so you know if a supercedure occurs. The bottom left photo shows capped honey. See how the texture of the honey cappings look shiny compared to the leathery brood cappings? If your hive has capped honey, you should not be feeding anymore. Even a couple of frames of open nectar is plenty to tell you to stop feeding. If there is no nectar or capped honey, feed 1:1 sugar water in a safe manner that will not induce robbing. Is there plenty of room for the queen to lay eggs? If the bees are putting nectar in the brood chamber, they need more room. 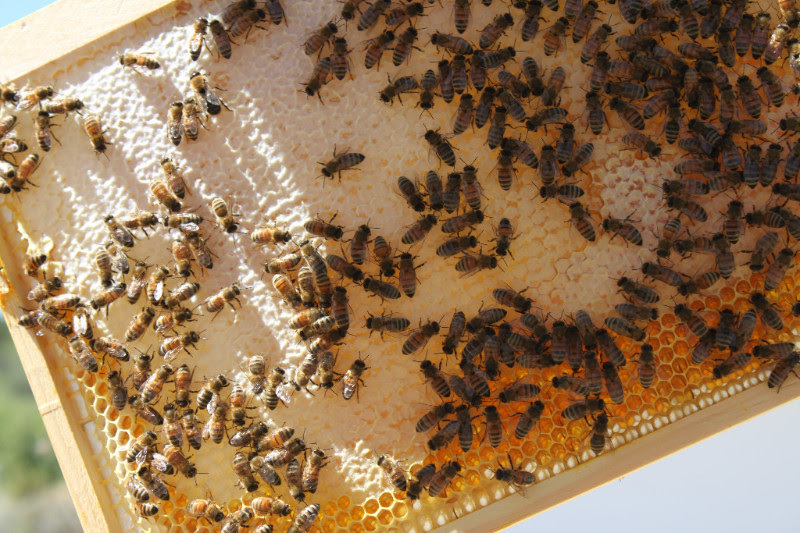 Put a sheet of drawn comb or a frame with foundation between the brood and honey frames, not in the middle of the brood chamber. 3b) Is there enough room for honey? Frames 1 and 10 should be honey. Frames 2 and 9 should be honey and bee bread. Frames 3,4,5,6,7. and 8 should be brood. Frames 1 and 10 will be the last to be filled. When frames 2-9 are finished, move 1 and 10 into the 2 and 9 spaces, and add another hive body. Top bar and long hives should have honey at the door, bee bread next, followed by brood. Keep moving the first honey frame back and adding bars or frames behind the last brood bar so that the bees can draw it for brood if they need more room for babies. http://coloradobeekeepers.org/wp-content/uploads/2017/10/csba-logo-for-footer.png 0 0 Tina Sebestyen http://coloradobeekeepers.org/wp-content/uploads/2017/10/csba-logo-for-footer.png Tina Sebestyen2018-07-19 12:41:432018-07-19 12:41:43Finding clues in brood frames, hive inspection. I must admit, I have a terrible weakness as a beekeeper. I can never give up. I see my girls trying their best to overcome some hurdle, and I want to help. After all, they haven’t given up.But, aside from ridiculous empathy for my bees, why put time and effort into a (usually) losing battle? Because I learn so much about the bees, about the problem, and often, about other problems that can be solved if only we know the solution. The risk as stated by one of my mentors when I told him what I was doing this week, “sounds like you are going to mess both colonies up”. So, before starting down the rocky road, asses your skill level and ask truthfully how likely you are to make one problem into two, or make the initial problem worse. This particular adventure started with the solar eclipse last August, the bee-clipse, as it has been dubbed. I discovered swarm cells in one of my colonies right before the eclipse. I also found the old queen. I pulled her and 4 frames of bees and brood, with no queen cells out into a nuc. My thinking was that there was a high probability that the new queen would not mate properly, or would not return from mating at all, I would return the old queen and bees to the hive, and we would go on preparing for winter. Another mentor laughed and said they were supercedure cells, and just wait and see. “Ha! I know the difference between supercedure and swarm cells”, I thought. Oddly, the old queen did not resume laying in her new digs for two weeks. 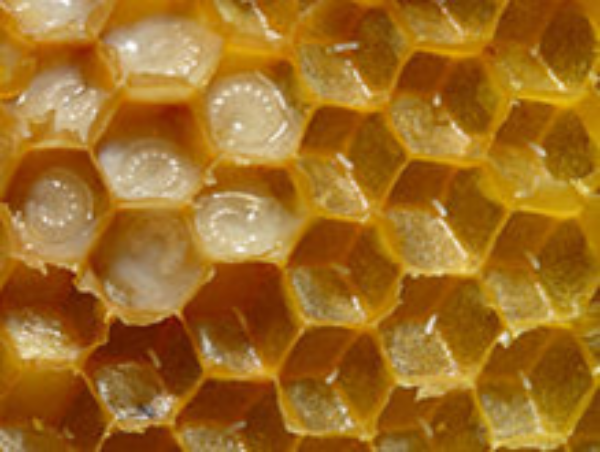 When she finally did lay some eggs, the bees started supercedure cells. The queen did not lay well at all, but only a small patch of brood. Arghhh! The bees must have killed the old queen, or she died, and neither new queen returned from mating flights. I re-combined the hives. So, now in mid-September I find I have a queenless colony. A friend has the same situation playing out in one of her hives, she says she’ll give me the old queen if her new one mates. We wait. In the meantime, some of my workers begin to lay. This means they will likely kill an introduced queen. The situation is becoming worse every day. Standard advice for a laying worker colony is not to bother with it. Shake the bees out onto the ground in the apiary, remove their hive so there is no home to come home to, and they will assimilate and be nice where ever they are allowed in. Alternatively, I have heard that you can just combine them all with a strong colony, but I have never been brave enough to risk a good queen that way. Finally in October, my friend sees eggs from her newly mated queen, and gives me her old girl. I learned a trick from Ross Conrad this summer about getting acceptance, and I had successfully used it in a colony that had killed 4 queens. (Messing around in a hopeless situation, that turned out not to be hopeless). I sprayed all the bees with a 4x concentration of Honey B Healthy and 1:1 sugar water and installed the queen in her cage without attendants, waited 3 days, sprayed them all again, including the queen, and direct released her. Ross says he has never gone the extra step and direct releases the queen immediately. 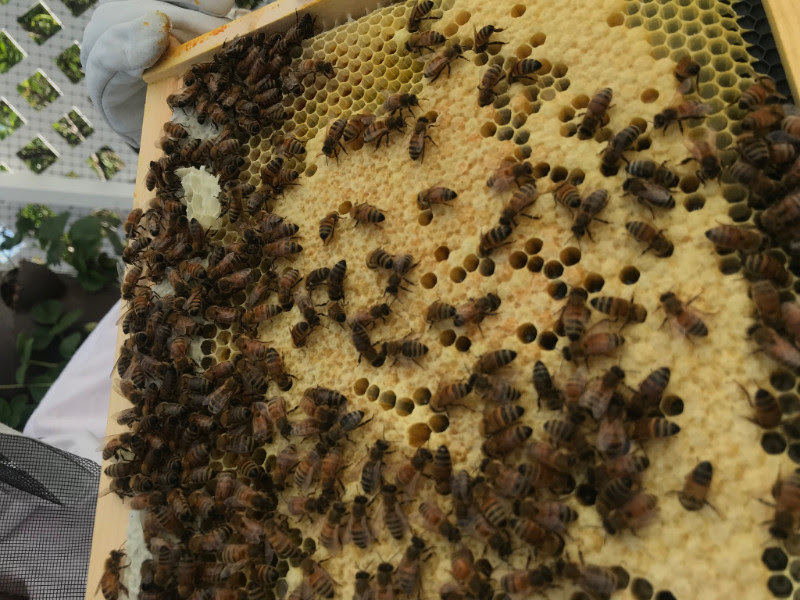 I always add a sheet of capped brood along with the queen in a situation like this to help normalize the pheromones in the hive. This trick worked here as well, and in October, the colony accepted my friend’s queen, but though she had been laying well previously, she did not lay any eggs in her new home. There were plenty of old bees, but no fat bees to live all the way through winter. This is just something new to watch and learn from.